During the Hungarian uprising against the communist authorities in 1956, the communist arms were removed from the center of their flag, leaving a hole. The Hungarian-flag-with-hole is still used by the Association of Political Prisoners (translation approximate, but essentially those Hungarians imprisoned after the uprising - the organization now commands some considerable influence in Hungary). The newspaper of the association is (or maybe was, as my info. is some years old) 'The Hole'. I used to have a metal lapel pin of the Hungarian flag, complete with hole, given to me by a friend who was a member. The hole was bigger than just the white stripe, since the arms also stretched into the red and green fields. The flag at <mkdsz.hungary.cc> has been given to the European Council on the 23rd of June 1999. This is an original flag. This flag has got the "Arms of the Revolution" since 24th of October 1956. 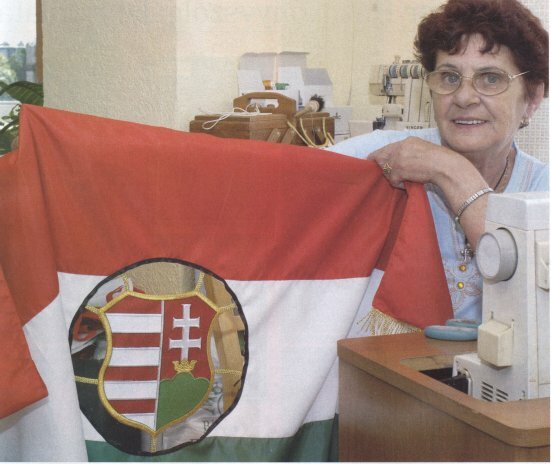 Till 1989 the flag was in the USA to represent the Hungarian Freedom. On 16th of June 1989 the flag was a participant in the reburial ceremony of Imre Nagy, the Prime Minister in the days of the Revolution and Independence War. He was executed on the 16th June 1958. At our church, St. Stephen of Hungary (Burlington, Ontario, Canada), we also have an authentic 1956 Hungarian flag, with the crest cut out, of course. I am unsure of this particular flag's history, but I could look into it, if you like. It is displayed three times a year: 1) On the Friday nearest October 23rd, when our scout troop takes it out to a nearby cemetary where we had a monument raised in rememberance of the Revolution, where we have a ceremony (often in the rain, for some reason), involving revolutionary poems, prayers, patriotic songs, and firsthand accounts by people who fought in the Revolution. 2) On the Sunday following said date, when it, the Canadian flag, and the boys' and girls' scout troops (not girl guides or whatnot) flags are displayed for a "zászlós mise", a "flags' mass". And, lastly, 3) At the luncheon following said mass, when it is paraded before local dignitaries, often including the mayor and the Hungarian Consul from Toronto. It should perhaps be pointed out that this flag ceased to be an exclusively historic flag. In recent years, it has very much become a political flag, specifically a symbol of opposition to Hungary's current administration. 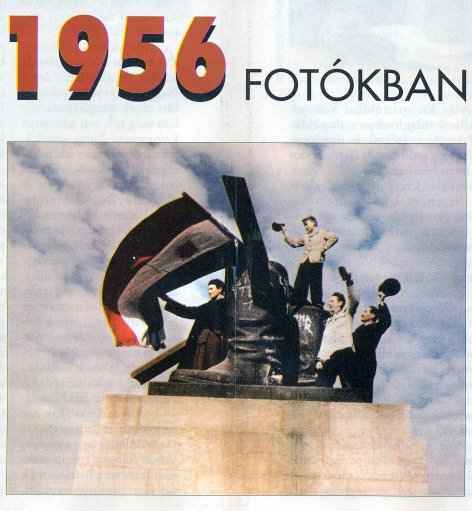 There is a photo at Élet és Tudomány (22 October 2004), of a tricolour with the Kossuth Coat of Arms in October 1956 at the demolished Stalin Statue. The Kossuth Coat of Arms (Coat of Arms without crown) has been used by the people at the revolutionary era: 1849, 1918, 1948, 1956, 1989. During May of 2004, there was a flag with a hole flying outside the Hungarian Parliament building in Budapest. Here is my photograph: <colindobson.co.uk> where it can be seen that the hole occupies the white band of the flag only and does not extend beyond that. The flag is on its own flag pole in the grassed area, away from the building, with a metal barrier around it. The exhibit at the Hungarain Museum in Cleveland included plenty of pictures, items and flags, including the one flying over parlament during the 1956 events. The Hungarian flag with hole has appeared these days in the demonstrations against the government. See photos at <news.bbc.co.uk>. Is there a difference between a historical holey flag and a modern holey flag? Yes and no. When I have heard the term "flag of 1956" ('56-os zászló') in conversation, it tends to have one, clear, undisputed meaning: A flag, now with a hole stretching into the red and green bands of the tricolour, which is treated with utmost respect, displayed annually in ceremonies and affairs dealing with the revolution, and has been in the possession of the community since that time. It seems to me that every Hungarian community which I know of and come into contact with has one of these; the flag itself is the symbol of the community, its origins (as refugees of the revolution), its survival. It is at the same time the "tomb of the unknown freedom-fighter", a monument to those alive and dead who were there, a visual and permanent reminder that we were defeated, but not destroyed. So, a "flag of 56" in its only sense which I am familiar with, is this respectful, ceremonial and solemn sense. What about any red-white-green flag with a whole in the middle? A flag of red-white-green with a hole in it at its most basic; the symbol of a nation with its heart cut out; or, a nation that has removed "those at the middle of it all": a government considered unfair, treacherous, undesirable, etc. The perception, of course, depends on the perceiver. What is the intention? Here, it is perhaps easier to see. In all cases, with the exception of the 'sacrosanct' flags of '56 mentionned above, a modern and historical holey flag are the same. They are symbols of protest; of the nation, the community, the people taking to the streets to protest a government it does not agree with, a refusal of the status quo. And it is in this spirit which they have been used. Perhaps here is where famed Canadian thinker Marshall McLuhan's most well-known quote fits: "The medium is the message". The medium: a flag with a hole in its centre, cutting out a symbol (perhaps Soviet, perhaps modern, perhaps blank - noone but the person who cut the hole knows); the message: "We Protest!" And thus, I conclude, that the flags of 1956 and today with holes in them are, and yet, are not the same thing. The flags are identical. It is their use which implies their difference.